The elections of May 23rd 2014 saw the second lowest turnout levels for local election contests in the history of the state – with only the turnout levels at the 1999 contests being lower. This marked a disappointing reversal of the general trend in turnout levels at general and local election contests in the 2000s, which saw a marked improvement on participation at the very low turnout contests of the 1999 Local and European Election and the 2002 General Election. 1,711,930 people turned out to vote at the 2014 Local and European Elections – this was down by almost two hundred thousand on the number who turned out at the 2009 contests (1,905,076), but admittedly the number that will be turning out to vote at the delayed Ballybay-Clones contest still has to be factored in here. The percentage turnout level nationally fell from 57.7% to 51.6% between these two contests, amounting to a decline of greater than six percent in the turnout level between the 2009 and 2014 elections. The level of decline relative to the 2004 contest was even greater, as Figure 2 show, although the 2014 turnout level was 1.4% higher than that for the 1999 contest, the lowest ever turnout level recorded for a local election contest in the history of the state. The turnout level for the Dublin region was notably higher than the level recorded in that region at the 1999 contest, but was in turnout significantly lower than the levels recorded in that region at the 2004 and 2009 local election contests. By contrast, it does seem that the 2014 elections may have represented the lowest ever turnout level recorded at a local election contest in the more rural parts of the state. 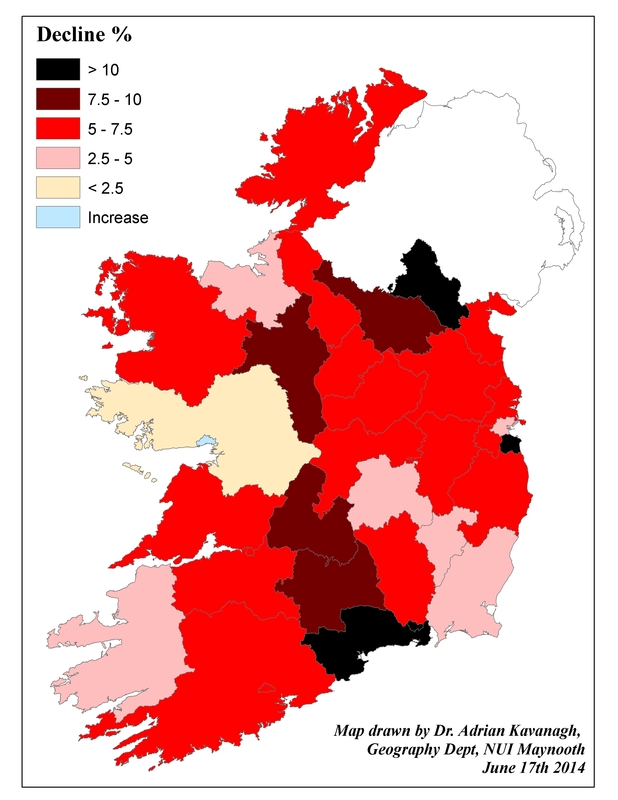 As Figure 2 shows, the average turnout level in the Connacht-Ulster region in 2014 was roughly five percent lower than the levels recorded in that region in 2004 and 2009, but it was also lower than the level recorded at the low turnout contest of 1999. Indeed the 2014 Local Elections would appear to represent the lowest ever local election turnout contest for a number of rural counties, but especially those located in the Border, West and Midlands regions (see Figure 3). Turnouts in 2014 were notably lower than in the low turnout 1999 contest in these counties. The biggest drop in turnout levels between 1999 and 2014 was in Monaghan, where turnout levels were 10.8% lower in 2014 than in 1999. Other counties experiencing notably lower turnout levels at the 2014 election than at the low turnout 1999 election included Sligo (decline of 7.5%), Leitrim (6.6%), Longford (6.1%), Cavan (5.2%) and….Nooooo!…Laois (4.1%). 2014 was indeed a record year for these counties in the wrong sense in terms of representing the lowest ever local election turnout levels in those counties’ histories, or at least the lowest ever local election turnouts in these counties over the past seven or eight decades. 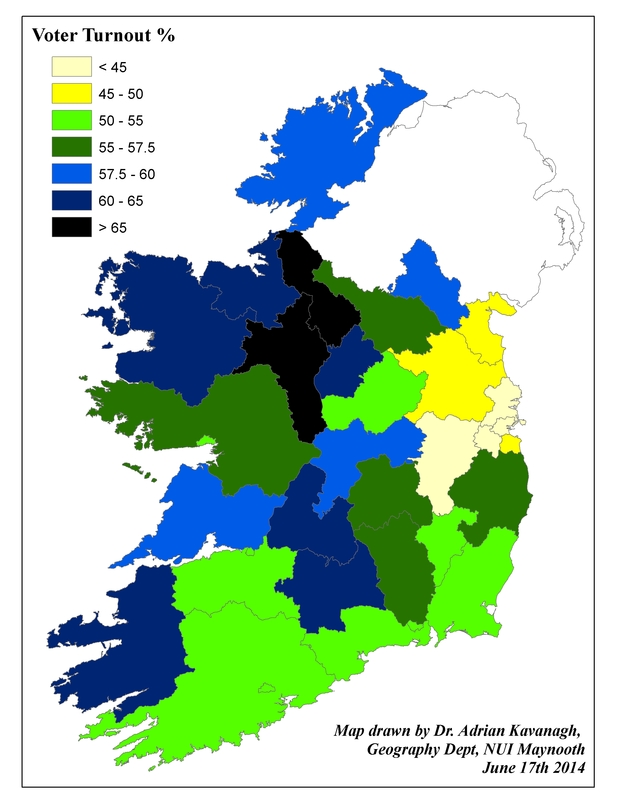 The other counties in which local election turnout levels were lower in 2014 than at the 1999 low turnout contest included Cork County (3.9%), Donegal (3.4%), Westmeath (2.8%), Roscommon (2.6%), Kerry County (2.1%), Mayo (1.6%), Tipperary (1.5%), Limerick (1.4%), Waterford (1.2%), Clare (1.0%), Meath (0.5%), Wexford (0.3%) and Galway County (0.1%). 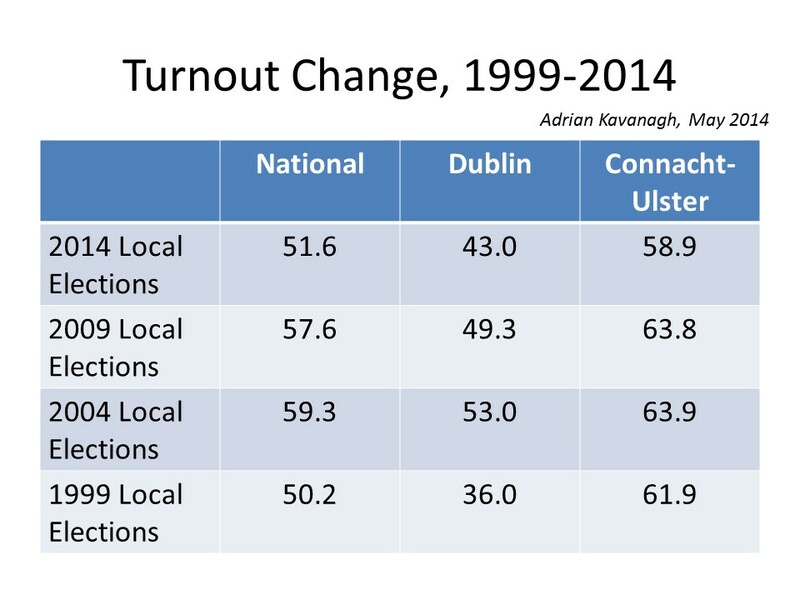 By contrast turnout levels were higher in 2014 than in 1999 in all of the Dublin local authority areas (see Figure 2), as well as in Cork City (4.0% higher) and Galway City (6.0%), as well as in the Dublin commuter belt counties of Kildare (1.7%), Louth (1.4%) and Wicklow (5.1%). While rural-urban turnout differentials have narrowed notably since 1999, turnouts still tend to be notably higher in the more rural areas at local (and general) election contests (though not necessarily at referendum elections). At the local authority level, Figure 1 shows that the general turnout patterns at the 2014 elections were similar to those of previous local election contests, with higher turnout levels in the more rural parts of the state (as also illustrated by Figure 2) than in the more urban regions and with especially high turnout levels in the West and North-West regions, as well as the South West and South Midland regions to a lesser extent. 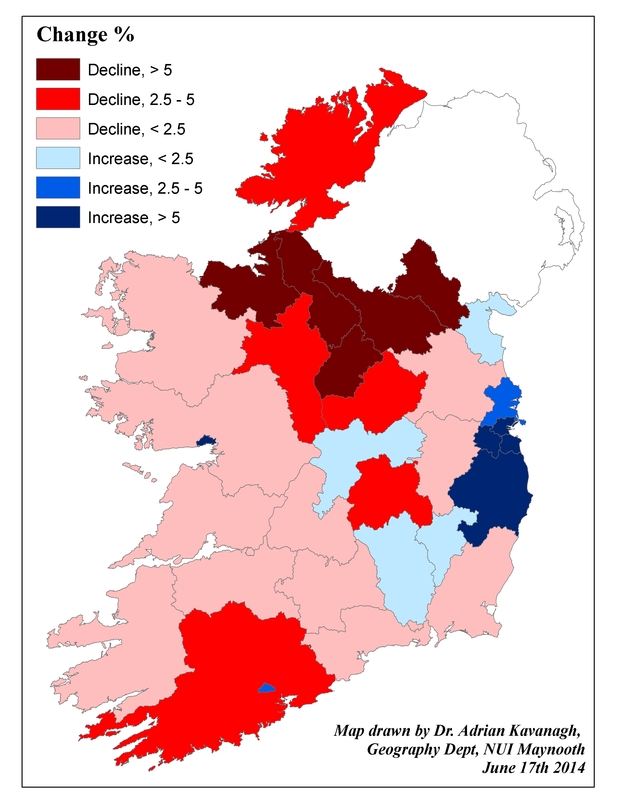 The lowest turnout levels nationally, as Figure 1, illustrates, were associated with Dublin and its immediate commuter hinterland. At the local authority level, Leitrim yet again emerged as the county with the highest turnout level at a local election contest (67.0%), being followed closely by neighbouring Roscommon (65.4%) in this regard. Only a handful of other counties had turnout levels of greater than sixty percent at these elections, including Longford (63.7%), Tipperary (61.9%), Mayo (61.0%), Sligo (60.9%) and Kerry (60.5%). At the other extreme, the lowest turnout levels at the local authority level was recorded in South Dublin County (42.1%), Fingal County (42.2%) and Dublin City (42.8%), with the next lowest turnouts being associated with Kildare (44.7%), Meath (45.3%), Dun Laoghaire-Rathdown (45.6%) and Louth (49.3%). At the constituency level, the highest turnout level nationally was recorded in Ballinamore (Co. Leitrim) (71.9%), with this being the only electoral area in the state to record a turnout level of more than seventy percent at the 2014 contests. A small number of other electoral areas had turnout rates of between sixty five and seventy percent, with these including Manorhamilton (Leitrim) (67.8%), Athlone (Roscommon) (67.7%), Ballymote-Tobercurry (Sligo) (67.0%), Granard (Longford) (66.8%), Templemore-Thurles (Tipperary) (66.5%) and Boyle (Roscommon) (65.9%). By contrast, the lowest turnout nationally in 2014 was recorded in Tallaght South (31.2%) – with a turnout level that was more than forty percent lower than that of the highest turnout electoral area, Ballinamore. This marked a change from the most recent local election contests, in which the very lowest turnouts nationally were associated with the electoral areas encompassing the Dublin Inner City area. But the Dublin Inner City electoral areas still figured amongst the lower turnout constituencies in any case, with the second and third lowest turnout levels nationally being recorded in North Inner City (36.5%) and Pembroke-South Dock (36.8%). The other electoral area encompassing part of the Dublin Inner City, Crumlin-Kimmage which included the South West Inner City area, had a low turnout level also; the turnout level in Crumlin-Kimmage (39.2%) was higher than in Swords (38,7%), though slightly lower than in the other low turnout electoral area, Mulhuddart (39.3%). The biggest drop in turnout levels between 2009 and 2014 at the local authority level (see Figure 4) was associated with Dun Laoghaire-Rathdown, with the average turnout level falling by 10.7% in that county. The turnout decline in that county was marginally higher than in Monaghan (10.5%) and Waterford (10.1%), though it is worth noting again that the average turnout level in Monaghan may improve, or even decline further, after the votes for the delayed Ballybay-Clones contest (on June 7th 2014) are factored in. Other counties experiencing notable levels of turnout decline between 2009 and 2014 included Roscommon (8.9%), Cavan (8.8%), Sligo (7.8%) and Kilkenny (7.5%). Turnout actually improved (by 0.5%) in Galway City between the 2009 and 2014 contests, but fell in every other local authority area, though the level of decline was notably smaller in Galway County (1.1%) than in the other parts of the state. Supporting the claims made by a number of commentators as to a drop off in turnout levels amongst the more middle class voters, Figure 5 shows this to be very much the case with turnout levels in the more middle class Dublin constituencies falling by over eight percent between the 2009 and 2014 contests, as compared with a lower level of decline (average of five percent) for the more working class constituencies in Dublin. 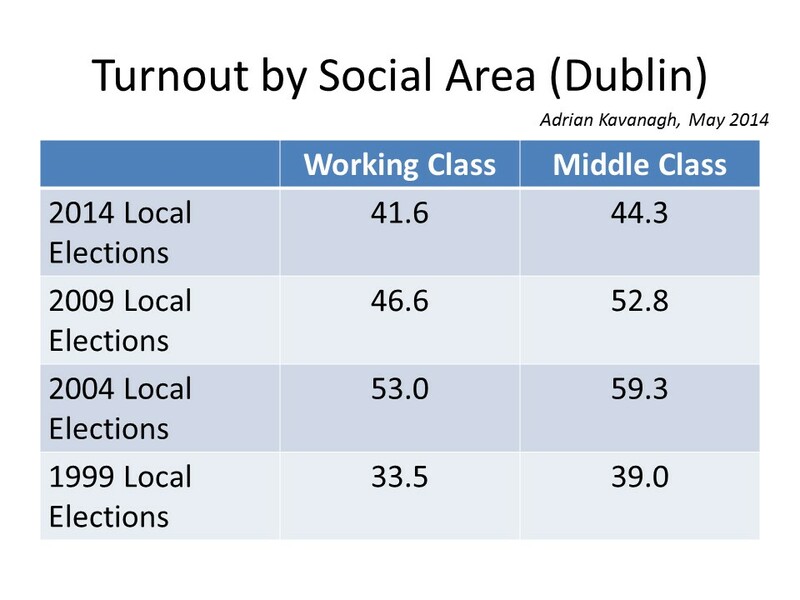 In turn, this factored into a narrowing of turnout differentials between middle class and working class areas in Dublin at these contests, a factor that may have played a role in the stronger electoral performances at the local election contests in Dublin by candidates from Sinn Fein, the People Before Profit Alliance, the Anti Austerity Alliance/Socialist Party and other left wing groupings relative to the results of the 2009 elections. This entry was posted in Connacht-Ulster, Dublin, Local Elections 2014, Voter turnout and tagged 2009, 2014, voter turnout. Bookmark the permalink.